An excellent user interface coupled with a good navigation system. Import bank, credit card and loan transactions from your financial institutions without hassle. With this personal finance software you can download your exchange rates and stock quotes with ease. 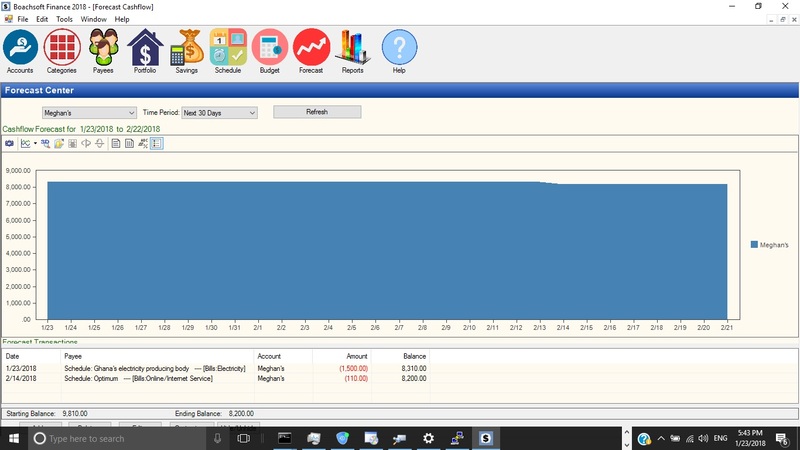 Boachsoft Finance comes with several tools for managing your finances. A set of these are planners. They include savings planner, mortgage planner, loan planner, annuity calculator. These help you in calculating the schedule for a loan or a mortgate. They also help you plan your savings. Apart from the Savings Planner, Boachsoft Finance comes has a Saving Center where you can setup and track your savings Goals. With Boachsoft Finance saving has never been easier. Forecast your finances. Forecast your account balances. Boachsoft Finance will help you forecast your future finances. With the awesome Forecast center you can forecast your finances using your scheduled transactions, budget data, special events your setup or even trends in your register. Boachsoft Finance supports all currencies. Schedule your future transactions with ease. Boachsoft Finance can automatically enter the transactions into the register when they are due. With Boachsoft Finance budgeting has never been simpler. Setup your budget with ease and follow it up with great reports. Having problem reconciling your accounts then boachsoft Finance is what you need. With finance you will reconcile your accounts in a simple process. Backup your data and restore in a simple process. With Boachsoft Finance 2018 you get all the above and even much more. Our landlord software is excellent and would meet your needs.